The EPA has a semi-interesting list of practical tips for building a fire in a wood stove. Mostly common sense stuff that seems obvious, except for the part that instructs us not to spread the coals flat. According to them you should rake the coals into a mound towards the door. 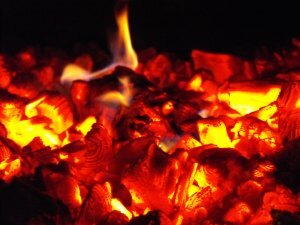 I have been guilty of raking my coals flat lately, but now I can see the light of an even more effecient fire. Another suggestion is to reload your stove with at least 3 pieces of wood each time, placing them on and behind the mound of hot coals. If you need a little extra warmth try this short video of tonight's fire.